"Urgent Care A Social Care Experience"
Nastassja Swift is a multi-disciplinary artist holding a Bachelors degree of Fine Art from Virginia Commonwealth University (VCU) with a major in Painting & Printmaking and a minor in Craft & Material Studies. 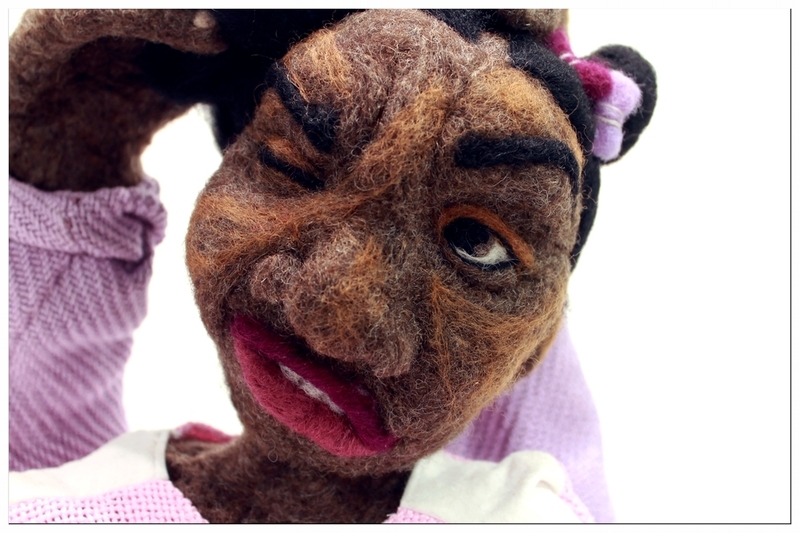 She is the owner and artist of D for Dolls, an online collection of handmade needle felted figures. Outside of being a doll maker, she works with paint, print and fiber within her studio practice. Her work is reflective of childhood, girlhood and identity, specific to race and gender. In the past year, she has shown work throughout Virginia, in Tennessee, California, and in Qatar, where she was the 2015-2016 Artist in Residence at VCU Qatar and put together her first solo exhibition. The solo show, I Keep Repeating it Over and Over in My Head, received rave reviews with publications in Oh LaLa Magazine, Qatar Tribune, The Peninsula Newspaper and The Gulf Times. Nastassja is currently living and working in Virginia Beach, VA.
Why is The Colored Girls Museum important? The Museum shares a history that isn’t present in any other gallery, museum or space. A history and series of stories that is specific to the most important person in this universe. The museum appreciates the black girl, supports her, tells her side, questions her, challenges her, uplifts her, encourages her and gives her the love she may not have known she needed. I feel as though the Colored Girls Museum is me, as it is every other black girl – it speaks to the different individual stories and our collective experiences as a whole. My work existing in the space feels natural, like it should be there, in conversation with the other black girls who are present through the work. Living in the space as one, and as many. What does Urgent Care mean to you? Urgent Care addresses the trauma, stress, anxiety, among other things, that we experience. And unlike any other space, it doesn’t stop at addressing the problem, rather providing the physical, emotional and mental remedies, time, attention and room that is necessary. Urgent care has a very “for us, by us” approach to making sure we are just as considered in every aspect of the space. My work that’s included speaks to a common experience of feeling the anxiety of existing as a black girl, in spaces where you’re not fully accepted, considered, tended to, or even acknowledged. For the work to be a part of the space allows for those feelings to be acknowledged, for some, maybe for the first time, in a world where it’s often ignored or said to be unimportant. The Colored Girls Museum is Back! (267) 630-4438, for more information. Group Tours are available Tuesday through Saturday by appointment only for groups of ten or more. Please contact us through our website for more information.